We Are the Catalyst; so what is the genre? I could spend half the review listing categories they’re listed in. I’ll cut to the chase and go for Dark Rock/Metalcore and hope we don’t fall out over it. The first good choice I made was to listen in a car; volume up, foot down. The opening song, “Delusion” sets the tone perfectly; four bars of Morse Code keyboard gives way to Håkan Strind’s fast, clinical, precise and absolutely thunderous bass drum and toms. If all else fails, WATC will blow you away with sheer power, but there’s a lot of subtlety and use of loud/soft dynamics there as well. “Delusion” is fairly representative of “Elevation”; there are thick wedges of Kenny Boufadene’s dirty, distorted guitar packing out the mid-range, underpinned by Joni Kaartinen’s solid bass to create an alternative Spector – the Dark Wall of Sound. And then Cat Fey’s powerhouse voice cuts through the glorious noise like a serrated knife. The mood of “Elevation” is dark throughout (no surprises there) with titles like “Our Dark World”, “Never Ending Night” and the album’s final song, the surprisingly slow quiet “Life Equals Pain”. The lines ’Up against a million claws, ripping out our beating hearts’ give a good feel of the mood of the album. The quiet verse/ear-bleedingly loud chorus dynamic is fairly common, but the song tempos generally vary from fast to very, very fast and there are breakdowns using synth washes and clean guitars as well. There’s a lot happening besides white noise guitars and percussion artillery. “Askja” builds from a clean detuned guitar and keyboard intro to a massive distorted guitar sound in the chorus and some uncharacteristic male/female harmonies (as a change from Kenny’s archetypal thrash metal strangled orc vocal) and is a nod in the commercial direction of Paramore, while “Home” is the dark parallel universe of “The Wizard of Oz”. We’re definitely not in Kansas anymore. 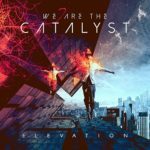 I wouldn’t say I’m a huge fan of the metal genres, but it’s difficult not to love the power, passion and percussive attack of We Are the Catalyst. “Elevation” is out on Friday 2nd September and you can pre-order here.